Sands Point is a village located at the northernmost tip of the Cow Neck Peninsula on the North Shore of Long Island in Nassau County, New York, United States. 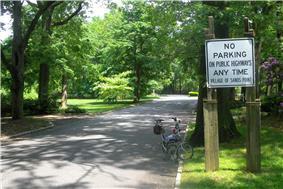 The Incorporated Village of Sands Point lies within the town of North Hempstead. The population was 2,675 at the 2010 census. The village was incorporated in 1910. In 1917, the village absorbed the communities of Barkers Point and Motts Point. It was originally owned by three families, the Sands, zoning allows subdivisions of 2 acres (8,100 m2) or more. The Sands Family Cemetery was added to the National Register of Historic Places in 1992. Sands Point is bordered almost entirely by water - Long Island Sound to the north, Manhasset Bay to the west and Hempstead Harbor on the east. 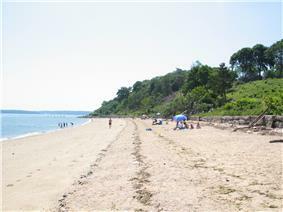 It shares land borders with the villages of Port Washington, Port Washington North, Manorhaven, and Soundview. Sands Point is located at . Sands Point and Port Washington are located in the geographic area known as Cow Neck Peninsula (also as Port Washington Peninsula or Manhasset Neck) bordered by Manhasset Bay, Hempstead Bay and Long Island Sound. According to the United States Census Bureau, the village has a total area of 5.6 square miles (15 km2), of which, 4.2 square miles (11 km2) of it is land and 1.4 square miles (3.6 km2) of it (24.56%) is water. As of the census of 2010, there were 2,675 people, 872 households, and 762 families residing in the village. The population density was 636.9 people per square mile (243.2/km2). There were 934 housing units at an average density of 222.4 per square mile (84.9/km2). The racial makeup of the village was 88.6% White, 0.8% African American, 8.2% Asian, 1.1% from other races, and 1.3% from two or more races. Hispanic or Latino of any race were 4.7% of the population. There were 872 households out of which 38.3% had children under the age of 18 living with them, 80.6% were married couples living together, 4.1% had a female householder with no husband present, and 12.6% were non-families. 10.4% of all households were made up of individuals and 7.1% had someone living alone who was 65 years of age or older. The average household size was 3.03 and the average family size was 3.21. In the village the population was spread out with 26.4% under the age of 18, 5.6% from 18 to 24, 15.4% from 25 to 44, 34.0% from 45 to 64, and 18.7% who were 65 years of age or older. The median age was 45.4 years. For every 100 females there were 95.7 males. For every 100 females age 18 and over, there were 95.4 males. As of 2013, the median income for a household in the village was $197,188, and the median income for a family was $218,400. Males had a median income of $158,500 versus $44,943 for females. The per capita income for the village was $112,716. About 0.0% of families and 0.5% of the population were below the poverty line, including 0.0% of those under age 18 and 0.0% of those age 65 or over. The town and "The Great Gatsby"
In F. Scott Fitzgerald's The Great Gatsby (1925), Sands Point (Port Washington/Manhasset neck) was referred to as "East Egg". 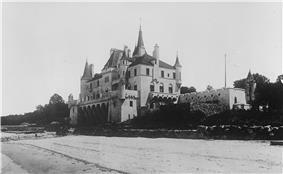 East Egg residents inherited their fortunes and were more highly respected than the nouveau riche in newer "West Egg" (Great Neck/Kings Point), because Sands Point had "old money". The story's fictional Buchanans lived in the western part of Sands Point. Reports incorrectly suggest that Fitzgerald – while he was a guest at the mansion of Herbert Bayard Swope on Hoffstot Lane, at Prospect Point in Sands Point – used the site and its parties as his inspiration for the fictional Buchanan home in East Egg. 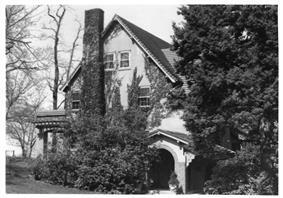 The home may have served as one of the many inspirations, as Fitzgerald did likely visit it during his time living in Great Neck (1922–24), but not as a guest of Swope's. Fitzgerald left Great Neck for Paris in 1924, prior to Swope's buying that mansion. The likely story with regard to Swope is that Fitzgerald and his good friend Ring Lardner would observe many parties held at the home Swope was residing in during the time Fitzgerald was actually living in the area. This Swope residence was adjacent to Lardner's home on Shore Road in Great Neck, and is not extant, though Lardner's mansion is still standing. Another Sands Point mansion, situated next to the Sands Point Light and across a shallow bay from Prospect Point, was Beacon Towers. Scholars believe it served as one of the many inspirations for Jay Gatsby's mansion in the novel, though Gatsby lived on the eastern side of Kings Point, in the book. 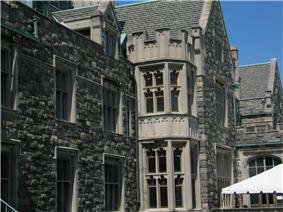 The extravagant Gothic-style residence was built by Alva Belmont, formerly Alva Vanderbilt, in 1918. It was demolished in 1945. Alva Belmont (1853–1933) Socialite and suffragette. Carlos Beltrán (born April 24, 1977) Professional baseball player. Daniel Guggenheim (1856–1930) Industrialist and philanthropist. William Randolph Hearst (1863-1951) Publisher. Kenneth Langone (born September 16, 1935) Co-founder (financial backer) of The Home Depot. Edgar F. Luckenbach (1868-1943) Shipping magnate. Condé Montrose Nast (1873-1942) Publisher. Arnold A. Saltzman (1916–2014) Businessman, diplomat, art collector, philanthropist. John Philip Sousa (1854-1932) Composer. Herbert Bayard Swope (1882-1958) Editor and journalist. ^ "Sands Point's Lands End goes on market for $30 million". Newsday.com, November 10, 2009, By Laura Mann. ^ Randall, Mónica (2003). The Mansions of Long Island's Gold Coast. Rizzoli. pp. 275–277. ^ "Carlos Beltran selling Sands Point home". Retrieved 2012-03-20. ^ "Sands Point, Long Island - Long Island New York". Retrieved 2011-07-16. Medieval Scenarios and Recreations, Ltd.